Zhang Shujian is an artist. CLC Gallery Venture is a new gallery based in Beijing and the result of a partnership between C5 Gallery and C-Space + Local. CLC Gallery Venture will start its operations from the locations of its founding partners in 798, Sanlitun and CaoChangdi. 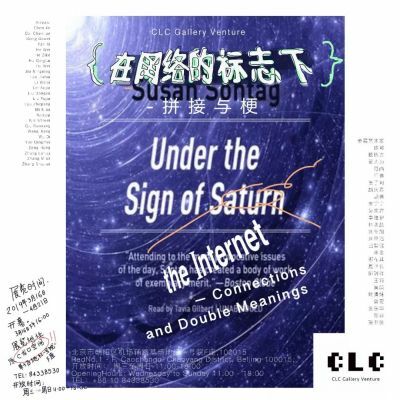 This first exhibition “Under the sign of the internet – connections and double meanings” will take place in CaoChangdi at the current location of C-Space + Local. A permanent new location for the gallery will be announced soon. The program of CLC Gallery Venture will be focused on promoting a group of some of the most exciting emerging Chinese artists working within a range of different media. The gallery intends to support its artists at their early stages of development through exhibitions both at and outside the gallery as well as help them to promote their work in an international context. To achieve this CLC Gallery Venture will support them with projects in and outside China and on occasion invite artists from abroad to do projects at the gallery. The Internet allowed information to explode and become accessible. Anything one wants to find out could be searched for online. However, the world did not become easier to know, instead it opened up to a bottomless abyss, waiting for people to fill. No matter how obscure the subject you are interested in, there could be an enormous universe behind it, and any contingent would open up to a black hole. There are many thousands of plateaus, sub-cultures, netizens, and more people searching for sub-culture. In the age of the Internet, diversity is not only necessary but has become a natural state, to retrieve this knowledge only takes the internet surfers inputting the search entries, and then copy and paste the content. In this sense, achieving a professional level in any field can be measured with the time spent searching, the more one spends time, the more one will know. By the same token, because the content is infinite, this time could take ten thousand years. In recent years, more and more artists have adopted the model that organizes and lists visual sources and materials in their practices. They are more inclined to use reason to suppress emotions while they iterate the various perspectives of a subject. In a way, this model produces Wikipedia-entry type of artworks, regardless of the depth of one's research. Their thinking has essentially become linear in spite of the various tangential add-ons. Subsequently, viewing this kind of works does not require moving the camera, because a fixed position would allow the viewer to see it from the beginning to the end.